Do you know how to say 'I love you' in Italian? In this lesson, you'll learn three different ways to say 'I love you' and a special phrase for Valentine's Day. Let’s start with the most common phrase. This phrase is direct. You should use it only when you're confessing your love. If you want to be less direct, you can use this phrase. [slowly] Sei così importante per me. It means "You mean so much to me." Now if you want to be more romantic in expressing your love for someone, you can say this phrase. [slowly] Le parole non possono descrivere il mio amore per te. It means "Words cannot describe my love for you." [slowly] Vuoi essere il mio Valentino? It means "Will you be my Valentine?" Let's wrap up this lesson by recapping what we've learned. Listen to the expression and repeat after me. "You mean so much to me." "Words cannot describe my love for you." Well done! [pause] Here's a fun fact! Do you know which picture symbolizes St. Valentine in Italy? It’s “The Kiss” or in Italian, "Hayez" by Francesco Hayez. The painting is preserved at the art gallery of Brera in Milan. This painting represents the passionate kiss of two young people who are destined to be separated. 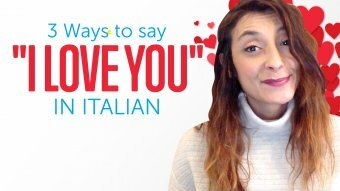 You just learned three different ways to say 'I love you' in Italian and one special phrase for Valentine's Day. Also, don’t forget to download your free cheat sheet on How to be a Good Lover in Italy, including words for romance, compliments, and pick up lines! Check out the description below and go to ItalianPod101.com now. I’ll see you next time. Grazie! Don’t forget to download your free cheat sheet on How to be a Good Lover. Just click here to download them!